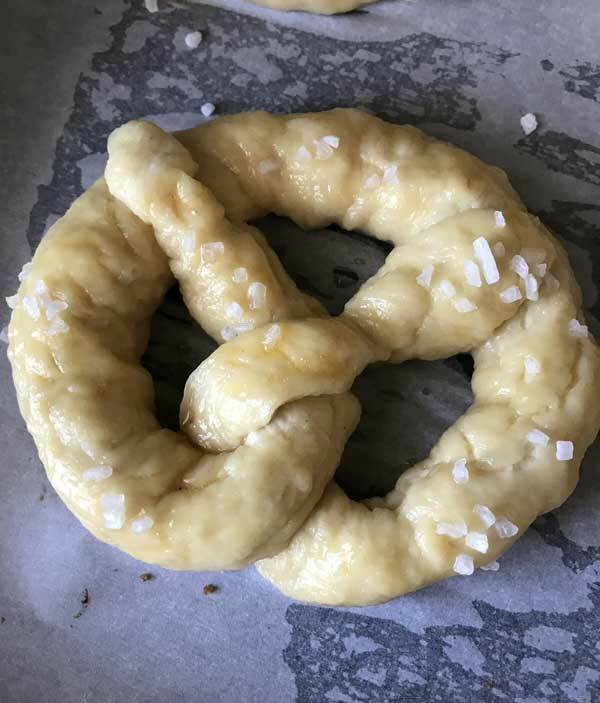 I have a tried and true recipe for pretzel bread, but it wasn’t until recently that I found a favorite recipe for homemade soft pretzels. It started off as Alton Brown’s recipe, but in the past 2 weeks I’ve changed it up a bit. The key change being I use quick rising yeast, which changes the mixing method somewhat. Plus I use brown sugar and beer in the dough for extra flavor. The dough is easy to work with and the pretzels taste great. If you use beer instead of water, you can really taste the beer in the baked pretzel. I made this batch with my favorite of Lagunitas. Another nice thing about this recipe is that the pretzels are boiled (like bagels) and then brushed with egg so they bake up nice and brown. I tried some recipes for unboiled pretzels, and while they tasted good, they were more like breadsticks. Lastly, the recipe halves quite nicely so you can make 5 pretzels at a time. And the pretzels freeze well, too. 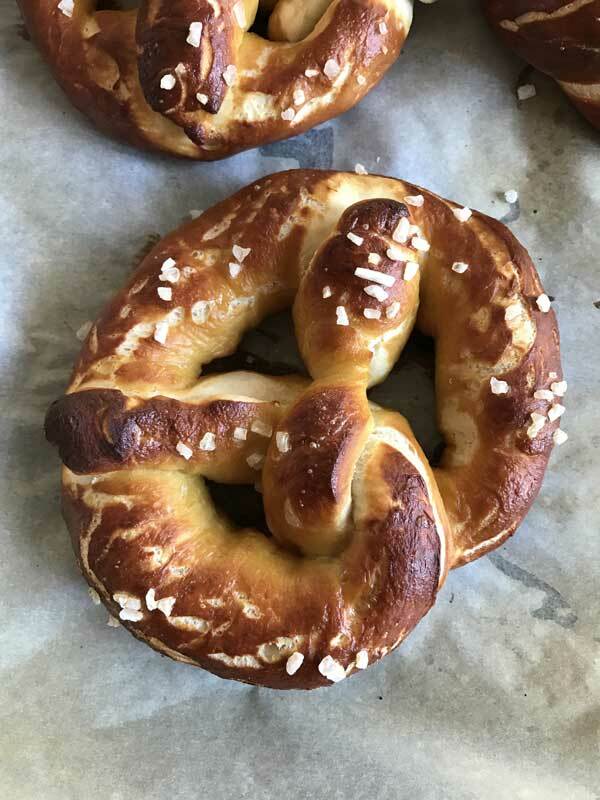 Homemade Soft Pretzels made with water or beer. The beer really does add a lot of flavor, so if you don't like beer use water. 1 1/2 cups water or beer, warmed to 130 degrees F.
In the bowl of a stand mixer, combine the yeast, sugar, flour and salt. Add the softened butter, then add the hot water gradually to the flour mixture, stirring until well mixed. Attach the dough hook and knead for about 8 minutes. If dough is too dry as it kneads, add a tiny bit of water. If it is too wet, add a little flour. Transfer dough to an oiled bowl and turn so that dough is lightly coated with oil. Cover and let rise for one hour. After dough has risen, divide it into 10 pieces. Roll out each piece of dough into a 24-inch rope and shape into a pretzel shape directly on nonstick foil or parchment lined baking sheet. 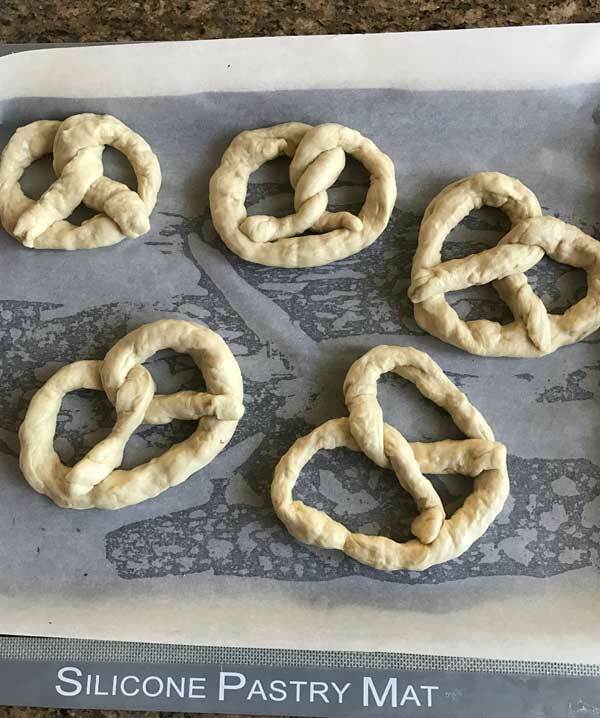 Working one piece at a time, put the shaped pretzel in the boiling water for 30 seconds, then lift it out with a slotted spatula and return to lined baking sheet. When all pretzels are formed, brush with the egg yolk mixture and sprinkle with salt. Bake for about 12-14 minutes at 450. 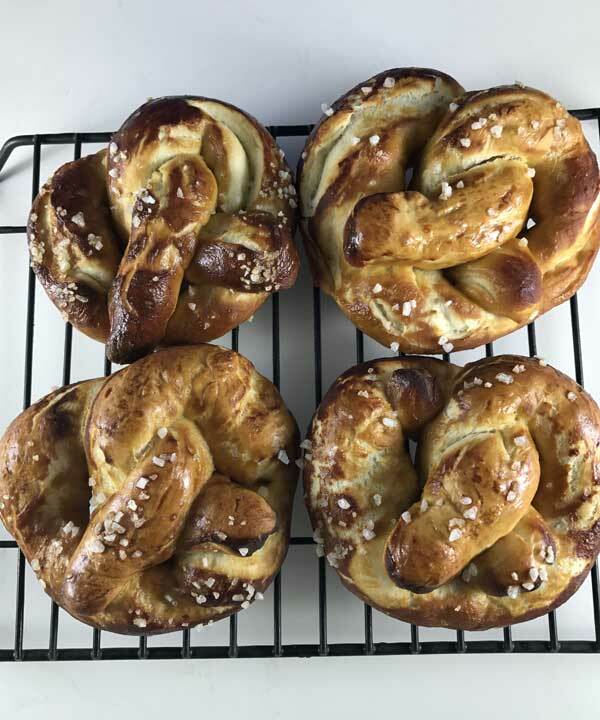 If you try these homemade soft pretzels, let me know. Now bring on the mustard! Hi Pat! Thanks for trying them and for taking the time to post a review. I’m really glad you liked them. 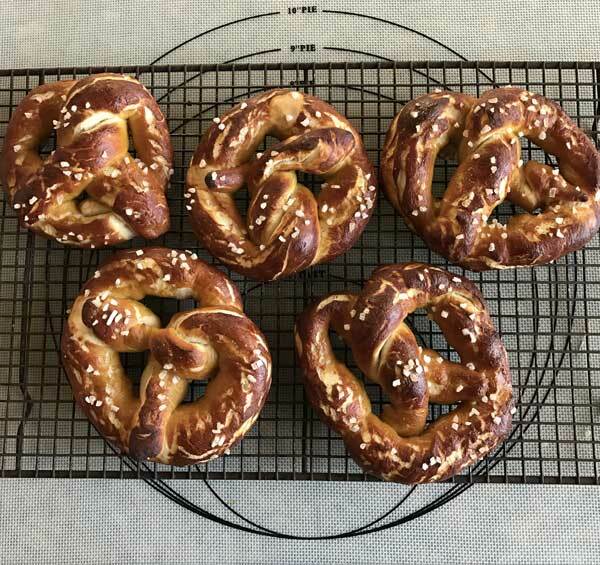 I just made a batch of these pretzels. They came out great and were actually easier to make than I expected. Made one with salt and one plain so we could put cinnamon sugar on them. I will definitely make them again. I haven’t made pretzels in years. These look so good! Beer takes these pretzels to a whole new level! Thank you for trying all of your experiments! Bookmarking to try!